Below are a few links that provide useful information on the surrounding area and facilities for Rostrevor, County Down. They are by no means an exhaustive list, and I am currently working on updating them. So if you feel that I am missing out on an important one, please contact me. Outdoor NI – Information on activities available in Northern Ireland with lists of activity providers. Links into walking, cycling, and canoeing websites also. 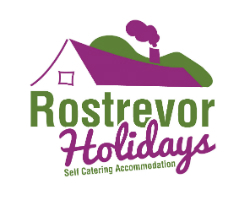 Mourne Heritage Trust – Area of Outstanding Natural Beauty – Rostrevor Holidays are located in the Mournes, an Area of Outstanding Natural Beauty. This website provides local information on the Mournes, with plenty of ideas for what to visit. Official Northern Ireland Tourist Board website, useful if you’re looking for ideas on what to visit fiurther afield. You can reach most parts of Northern Ireland within 3 hours driving from Rostrevor Holidays. Fiddler’s Green International Festival – Rostrevor – The world-famous annual week-long music festival held in Rostrevor. Over 200 events, including outdoor Ceilis, open air stage, art exhibitions and plenty of children’s activities. The National Trust website for Northern Ireland. For beatiful and inspiring places to visit in Northern Ireland, including gardens, historic mansions, and days out with a difference. My Secret Northern Ireland – An interesting and informative read for those wishing to visit Northern Ireland. Written by a Mediterranean girl who lived in Northern Ireland for several years, and wrote this travelogue to help her cope with missing this “green and pleasant land” once she left. Walk NI A guide to walking areas in Northern Ireland. Provides a great guide to Walking in the Mourne Mountains which is a downloadable PDF file. Cycle NI a website with information on cycle routes in Northern Ireland. Canoe NI offers your definitive guide to canoeing in Northern Ireland. With information on canoe trails, canoe rental, canoeing kayaking lessons / courses and canoeing holidays. Mountain Biking in Rostrevor – Not the Sunday Run Run by a small group of locals that are into mountain biking. Has some great information on the local area, and the gallery is well worth taking a look at for some fantastic pictures of the Rostrevor scenery, even if you are not into cycling. Trail Badger -Northern Ireland boats some fantastic mountain biking opportunities, and Trail Badger is the source to go to if you’re looking for trails. Written and rated by those who know them best. Based in Rostrevor, 26Extreme organise off-road events around Ireland including the Mourne Way Marathon which goes from Newcastle to Rostrevor, The Coast2Coast, which finishes in the Mourne Mountains, and The Kilborney Challenge – an adventure race around Rostrevor. East Coast Adveture offer a wide range of outdoor pursuits, adventure activities, outdoor education and environmental programmes to suit all types of groups. Located in Rostrevor, they will arrange activities from Rostrevor Holidays. Hill walking and Hiking in the Mourne Mountains and Cycling in Mourne and St Patricks Country with Outdoor Ireland North: Guided tours of the Mournes Loretto provides guided walks and cycling trips to all levels of abilities and ages. Every week there is something on, so if you want to explore the Mournes, you’re in safe hands with the knowledgeable guide. Mourne International Walking Festival – Northern Ireland. A festival which combines walking the mournes, traditional music, and sampling the local cuisine. The OUTLET – Banbridge Over 65 shops offering up to 70% discount on top brands. The Quay’s shopping & leisure complex – Newry The Quays houses big chain stores such as Debenhams and Sainsburys, along with shos such as Faith Shoes, Oasis, Next, River Island, and Monsoon. Complex also includes 8-screen cinema. Buttercrane Shopping Centre – Newry Situated beside The Quays in Newry, Buttercrane has Marks & Spencer, Dunnes Stores, Topshop, Primark to name but a few. Our holiday accommodation is listed on lovetoescape.com, which also has a great range of B&Bs.